The world of mathematical formulas and jargon in Microsoft Excel is complex and can be intimidating for even advanced computer users. Perhaps like you, a majority of users find it difficult to get the most they can out of this very valuable program. 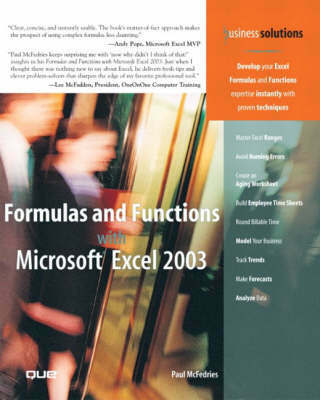 Formulas and Functions with Microsoft Excel 2003 strives to break down the complexities by focusing on the four primary technologies to master: ranges, formulas, data analysis tools and lists. Chapters such as "Getting the Most Out of Ranges," "Building Your Own Functions Using VBA," and "Solving Complex Problems with Solver" will teach you practical skills and solutions that you can put to work immediately. Frustration will become a thing of the past as you begin to master the complex world of Excel!